Indirect mirror laryngoscopy is the traditional modality used to perform laryngeal examinations on dysphonic patients. The rod lens telescope, introduced by Hopkins, has several advantages over the traditional indirect laryngoscope. It produces a magnified, recordable image of the larynx that is superior for the diagnosis of mass lesions and mucosal wave abnormalities, especially when performing stroboscopy. The drawback to rigid laryngovideostroboscopy remains that the larynx is tethered in a nonphysiologic position and subtle changes in laryngeal function cannot always be assessed accurately. The flexible fiberoptic laryngoscope, introduced by Sawashima and Hirose in 1968, allows visualization of the larynx with the patient in a comfortable, natural position. More recently, "chip-tip" digital flexible endoscopes have revolutionized the visualization capabilities of indirect laryngoscopy and allow stroboscopy to be performed with near comparable clarity to that achieved with a rigid endoscope. Newer developments in laryngeal imaging and mobile technology are on the horizon. This article describes an appropriate method by which a comprehensive dynamic voice evaluation is completed using flexible laryngoscopy. 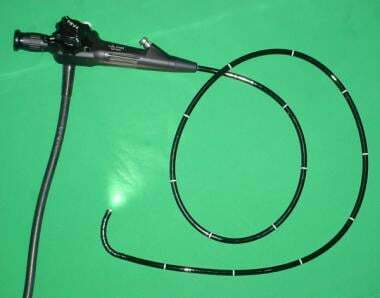 The image below depicts a flexible endoscope. The vocal cords are composed of mucous membrane infoldings that stretch horizontally across the middle laryngeal cavity. They are attached anteriorly at the angle on the interior surface of the thyroid cartilage and project posteriorly to the arytenoid cartilages on either side. The vestibular folds, or false vocal cords, are formed by the superior layer of infolded membrane; the vocal folds, or true vocal cords, are formed from the inferior layer of infolded membrane. The laryngeal ventricles extend laterally and are located between the vestibular and vocal folds. For more information about the relevant anatomy, see Larynx Anatomy and Vocal Cord and Voice Box Anatomy. Laryngeal examinations are appropriate for patients with complaints of dysphonia, chronic cough, respiratory abnormalities, laryngeal irritation, or dysphagia. Indirect mirror laryngoscopy may be inadequate for the diagnosis of mass lesions when patient gagging does not permit adequate visualization. Because of the gagging and the unnatural position of the larynx during the examination, mirror laryngoscopy is not practical for the diagnosis of voice disorders that relate to physiologic and functional pathology. After the patient is seated, anterior rhinoscopy is performed, and then a topical decongestant is applied to both sides of the nasal cavity in anticipation of a potentially difficult posterior nasal anatomy. Several choices of topical decongestants are available (eg, phenylephrine hydrochloride [Neo-Synephrine], ephedrine, oxymetazoline, epinephrine). Following or concurrently with decongestion, topical anesthesia is applied. Once again, several choices are available, including 4% lidocaine and 2% tetracaine. The preferred practice is to wait for several minutes after the application of topical medicines to allow for maximum effect. The patient should be seated comfortably before the examination begins. He or she should be instructed to put their hips all the way to the back of the chair and lean forward from the waist. The head should be brought into the sniffing position with the neck flexed but head extended. The patient likely will need encouragement to keep their lower jaw forward while at the same time not losing the sniffing position obtained previously. This position provides ideal space in the pharynx to avoid unnecessary touching and gagging and brings the larynx into an optimal position for visualization while not altering baseline anatomy of laryngeal function. The procedure should be explained, and the patient should be seated comfortably prior to commencing the examination in the position noted above in Positioning. Gentle reassurance is often necessary. Anterior rhinoscopy is performed and anesthesia is administered as described above in the Anesthesia section. With the patient positioned appropriately, pass the flexible laryngoscope into the nasal cavity. Examine the nasal cavity for nasal septal deviation, polyposis, and other causes of nasal obstruction that could contribute to the voice disorder. Two areas that often allow for easy passage through the nasal cavity include the floor of the nose and between the inferior and middle turbinates. The inferior route is often less painful for a longer examination. After passage through the nasal cavity, visualize the nasopharynx. Examine the nasopharynx for evidence of adenoid hypertrophy or other obstructive masses. Evaluate patency of the eustachian tubes bilaterally. At this time, direct attention to the soft palate. First, ask the patient to produce a prolonged "EE" sound. During this sustained phonation, observe the soft palate for evidence of tremor. The differential diagnosis of such a tremor includes a variety of neurologic conditions including Parkinson disease, essential tremor, and pseudobulbar palsy. Observe the free edge of the soft palate for adequacy of contact with Passavant's ridge along the posterior wall of the nasopharynx. A gap between them or observation of a lack of lateral pharyngeal squeeze is diagnostic of velopharyngeal insufficiency (VPI). The differential diagnosis for VPI includes a vagal nerve injury or other neurologic weakness, cleft palate (both overt and submucous), stroke, and iatrogenic injury from a previous soft palate or tonsil surgery. Subtler VPI can be diagnosed during sustained phonation. This manifests as bubbling at the junction of the soft palate and posterior pharyngeal wall resulting from air leakage across the velopharyngeal junction. Perform this further evaluation of velopharyngeal closure by having the patient say "Coca Cola" and sustain a hissing "S" sound. Upon completion of the nasopharyngeal examination, ask the patient to breathe slowly through the nose. As the soft palate pulls away from Passavant's ridge, advance the tip of the flexible laryngoscope into the oropharynx. First observe the base of tongue at rest and look for fasciculations and/or asymmetry. Instruct the patient to protrude the tongue. Examine the base of the tongue and vallecula for evidence of tremor, weakness, or pooling of secretions. Also observe for neoplasms, retention cysts, or lingual tonsillitis. Ask the patient to perform the Valsalva maneuver by puffing out their cheeks. This allows examination of pyriform sinuses for pooling of secretions or a neoplasm. Position the tip of the laryngoscope just above the level of the epiglottis. If the glottis is not clearly visualized because of posterior displacement of the epiglottis, remind the patient to lean forward and protrude the chin. Instruct the patient to breathe quietly. Observe the glottis for evidence of inappropriate adduction during inspiration or expiration that could be consistent with paradoxical vocal fold movement disorder if their history is also contributory. Ask the patient to produce a sustained "EE" sound. Carefully examine the glottis for lesions, vocal fold mobility, and vocal fold atrophy. Common glottic lesions include nodules, cysts, papilloma, leukoplakia, and neoplasms. Common vocal cord movement abnormalities include paresis (reduced vocal fold motion), paralysis, tremor, and hyperfunctional voice disorders (eg, muscle tension dysphonia [MTD]). Atrophic vocal folds are associated with a prominence of the vocal process of the arytenoid due to a loss of the muscle bulk of the membranous portion of the vocal fold and deepening of the laryngeal ventricle. An elliptical closure pattern is often seen in atrophic vocal folds. Ask the patient to phonate continuously and slide from a low-pitch to a high-pitch on an "EE" vowel and then slide back down from high to low pitch in the same fashion. The vocal folds should lengthen symmetrically when going from low to high and shorten symmetrically when going from high to low. Unilateral paralysis manifests as an inability to lengthen the ipsilateral vocal cord. If both vocal folds fail to lengthen, this may indicate bilateral superior laryngeal nerve palsies. In patients with vocal fold paralysis, the atrophic paralyzed vocal fold may lie cranial or caudal to the healthy vocal cord. The detection of such a level of mismatch may be important in optimizing the results of vocal fold medialization. An evaluation of vocal fold paralysis should include vocal fold position, bulk, and length/tension. Perform further assessment of vocal fold mobility by requesting the patient say "HEE - HEE - HEE" with a breath between each "HEE" sound or, preferably, having the patient alternate between an "EE" and a sniff through the nose. This produces alternating maximal adduction and abduction of the vocal folds, allowing for the detection of subtle movement abnormalities. For example, a person with recovered vocal fold paralysis may demonstrate a subtle decrease in abduction that could otherwise be missed. In situations in which a lack of vocal fold movement is observed during attempts at phonation and a functional etiology is suggested, ask the patient to cough or clear their throat. Alternately, the tip of the laryngoscope may be used to touch the tip of epiglottis in order to stimulate the cough reflex. Adduction of the vocal folds in this situation confirms a functional etiology. Hyperfunctional speech (eg, MTD) is accentuated through the production of "EE" and "OO" sounds. Ask the patient to repeat one (or more) of the following sentences: "We see 3 green trees; you should use new blue shoes," or "You could need 2 new shoes if these don't fit." MTD often manifests as adduction of the false vocal cords or the anteroposterior shortening of the larynx during connected speech production or both. The voice is generally rough or strained with an effortful phonation. Primary MTD can often result after a URI or other temporary laryngeal insult (eg, mild paresis, transient overuse lesion) and manifests as residual, incorrect use of the laryngeal apparatus; it is often corrected with speech therapy. In certain cases, subtle MTD missed with the above exercises may be demonstrated by having the patient engage in normal daily speech. For example, a teacher may be asked to start a lecture or a salesperson asked to start a sales talk. This exercise is particularly useful for planning speech therapy and for evaluating progress in those patients who are already undergoing therapy. Sometimes, having the patients sing is useful. In a patient without professional voice training, singing a simple song, such as "Happy Birthday," may produce useful information regarding the ability of the patient to change pitch and may demonstrate spasms or tremors. In a patient who has professional voice training, singing their normal repertoire under laryngoscopic visualization often elucidates findings useful for guiding voice therapy. Finally, advance the tip of the flexible laryngoscope past the tip of the epiglottis so that it lies just above the false vocal folds. Perform video stroboscopy as the patient produces a sustained "EE" sound. Subtle lesions also may be noted. If a subtle mucosal lesion is detected that requires further characterization, a rod lens telescope, which yields a clearer, larger view of the glottis, may be used. Patients have a rough voice with a variable pitch. They may have anterior neck pain or tenderness due to tension in the strap muscles. Patients demonstrate inappropriate false cord approximation. Additionally or as a separate finding, patients have apparent anteroposterior shortening of the larynx with anterior tilting of the arytenoids. Be vigilant to look for an underlying change in vocal fold motion, glottal insufficiency, or lesion to explain the finding of supraglottic hyperfunction. Lesions may have formed in response to hyperfunctional behaviors due to underlying glottal insufficiency. "We see 3 green trees." "You could use new blue shoes." "You could need 2 new shoes if these don't fit." Regarding adductor SD, patients have strained/strangled voice breaks, generally during voiced sounds. Symptoms often resolve while singing or mocking cartoon voices. Regarding abductor (SD), patients have breathy voice breaks, generally at onset of speech. This is accentuated by plosives or stops. Voice symptoms may be associated with dystonias in other groups (eg, blepharospasm). For adductor SD, patients demonstrate dramatic and forceful glottic adduction, including supraglottic findings similar to muscle tension dysphonia (MTD), with voice breaks. For abductor SD, patients demonstrate crisp vocal fold abduction with voice breaks. For adductor SD: "You should use new blue shoes" or "We eat eels every Easter"
For abductor SD: "Buy Bob a baseball" or "Pay Paul a penny." The voice may be normal. However, patients with this disorder often have dysphonia from other causes. Patients may have a breathy voice due to a functional voice disorder. Dysphonia is generally observed in conjunction with laryngopharyngeal reflux disease (LPRD). Patients with severe cases of paradoxical vocal cord movement may present with stridor and dyspnea and a history of ER visits and/or airway interventions is not uncommon. Strong odors such as perfumes, gasoline, and cleaning products often set the patient into a spasms. While watching quiet breathing, the patient demonstrates paradoxical vocal fold adduction during inspiration and/or expiration. The patient may have findings of LPRD, such as a diffusely erythematous larynx, posterior glottic erythema, or pachydermia in the interarytenoid area. The significance of expiratory closure during quiet respiration is unclear and may represent a physiologic finding. The history is often more telling than the examination findings. The patient is asked to breathe quietly. The patient is asked to maximally inspire and exhale. Asking the patient to breathe perfume may demonstrate the otherwise subtle findings. The patient's voice is sometimes rough, breathy, or higher in pitch. Patients often complain of loss of volume or vocal fatigue. The patient demonstrates a thinned vocal cord with prominence of the vocal process, which is often referred to as a "bowed" vocal cord. Stroboscopy demonstrates complete but short phase closure or an elliptical closure pattern. This is often associated with secondary MTD. The voice ranges from breathy to normal depending on the position of the immobile cord and the degree of atrophy. The patient may complain of vocal fatigue and neck muscle pain, demonstrating MTD. In cases in which the vocal cord is lateralized, patients may have dysphagia, a weak cough, and aspiration. Associated vocal cord atrophy may be present. Care should be taken to ascertain the level of vocal cords. The paralyzed cord may lie more cranially or caudally than the normal cord, which could affect the results of surgical medialization. A displaced arytenoid may be indicative of arytenoid dislocation and EMG should be obtained to confirm nerve-muscle interaction. Paresis may be mild and an obvious motion abnormality may be difficult to assess. Suspect a weakness of a vocal fold when stroboscopy demonstrates asymmetry or a complete but short phase closure pattern. Vocal fold immobility is accentuated by having the patient say "EE" and then sniff many times in a row. This vocalization followed by deep inspiration produces maximal adduction followed by maximal abduction. Unilateral vocal fold paralysis before and after surgery are shown below. The voice is breathy and sometimes aphonic. The patient may have paradoxical vocal fold movement. Nonatrophic cords with significant bowing may be seen during attempts to phonate. Significant supraglottic hyperfunction may be seen. Appropriate adduction and glottic closure may occur with coughing, laughing, or singing. Symptoms may be associated with the additional finding of spasmodic dysphonia. They are often observed in conjunction with vocal cord atrophy. A tremor in other muscle groups may be present. During the nasopharyngeal examination, tremor of the soft palate may be noted as the patient makes a prolonged "EE" sound. Upon tongue protrusion, a tremor of the tongue base can be seen. A tremor in the strap muscles may produce a rhythmic elevation of the larynx. Sulica L. Laryngoscopy, stroboscopy and other tools for the evaluation of voice disorders. Otolaryngol Clin North Am. 2013 Feb. 46 (1):21-30. [Medline]. Sawashima M, Hirose H. New laryngoscopic technique by use of fiber optics. J Acoust Soc Am. 1968 Jan. 43(1):168-9. [Medline]. Barkmeier-Kraemer JM, Patel RR. The Next 10 Years in Voice Evaluation and Treatment. Semin Speech Lang. 2016 Aug. 37 (3):158-65. [Medline]. Rubin AD. Neurolaryngologic evaluation of the performer. Otolaryngol Clin North Am. 2007 Oct. 40(5):971-89, vi. [Medline]. Franco RA, Andrus JG. Common diagnoses and treatments in professional voice users. Otolaryngol Clin North Am. 2007 Oct. 40(5):1025-61, vii. [Medline]. Carroll TL, Wu YH, McRay M, Gherson S. Frame by frame analysis of glottic insufficiency using laryngovideostroboscopy. J Voice. 2012 Mar. 26(2):220-5. [Medline]. Hawkins DB, Clark RW. Flexible laryngoscopy in neonates, infants, and young children. Ann Otol Rhinol Laryngol. 1987 Jan-Feb. 96(1 Pt 1):81-5. [Medline]. Lancer JM, Jones AS. Flexible fibreoptic rhinolaryngoscopy. Results of 338 consecutive examinations. J Laryngol Otol. 1985 Aug. 99(8):771-3. [Medline]. Lancer JM, Moir AA. The flexible fibreoptic rhinolaryngoscope. J Laryngol Otol. 1985 Aug. 99(8):767-70. [Medline]. Sataloff RT, Spiegel JR, Hawkshaw MJ. Strobovideolaryngoscopy: results and clinical value. Ann Otol Rhinol Laryngol. 1991 Sep. 100(9 Pt 1):725-7. [Medline]. Selkin SG. Clinical use of the pediatric flexible fiberscope. Int J Pediatr Otorhinolaryngol. 1985 Oct. 10(1):75-80. [Medline]. Silberman HD, Wilf H, Tucker JA. Flexible fiberoptic nasopharyngolaryngoscope. Ann Otol Rhinol Laryngol. 1976 Sep-Oct. 85(5 Pt.1):640-5. [Medline]. Sodersten M, Lindestad PA. A comparison of vocal fold closure in rigid telescopic and flexible fiberoptic laryngostroboscopy. Acta Otolaryngol. 1992. 112(1):144-50. [Medline]. Stiles CM, Stiles QR, Denson JS. A flexible fiber optic laryngoscope. JAMA. 1972 Sep 11. 221(11):1246-7. [Medline]. Welch AR. The practical and economic value of flexible system laryngoscopy. J Laryngol Otol. 1982 Dec. 96(12):1125-9. [Medline]. White JF, Knight RE. Office videofiberoptic laryngoscopy. Laryngoscope. 1984 Sep. 94(9):1166-9. [Medline]. Yanagisawa E, Owens TW, Strothers G, Honda K. Videolaryngoscopy. A comparison of fiberscopic and telescopic documentation. Ann Otol Rhinol Laryngol. 1983 Sep-Oct. 92(5 Pt 1):430-6. [Medline]. Yanagisawa E, Yanagisawa K. Stroboscopic videolaryngoscopy: a comparison of fiberscopic and telescopic documentation. Ann Otol Rhinol Laryngol. 1993 Apr. 102(4 Pt 1):255-65. [Medline]. Disclosure: Serve(d) as a director, officer, partner, employee, advisor, consultant or trustee for: Pentax Medical; Sofregen Medical<br/>Received income in an amount equal to or greater than $250 from: Pentax Medical; Sofregen Medical.